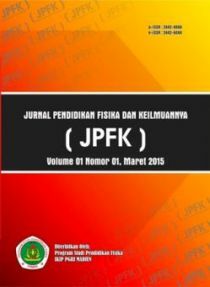 Jurnal Pendidikan Fisika dan Keilmuan (JPFK) with registered number ISSN 2442-8868 (printed), ISSN 2442-904X(online) is scientific journals which publish articles from the fields of physics and physics education. JPFK will publish in two times issues Volume 1, Numbered: 1-2 are scheduled for publication: March and September. 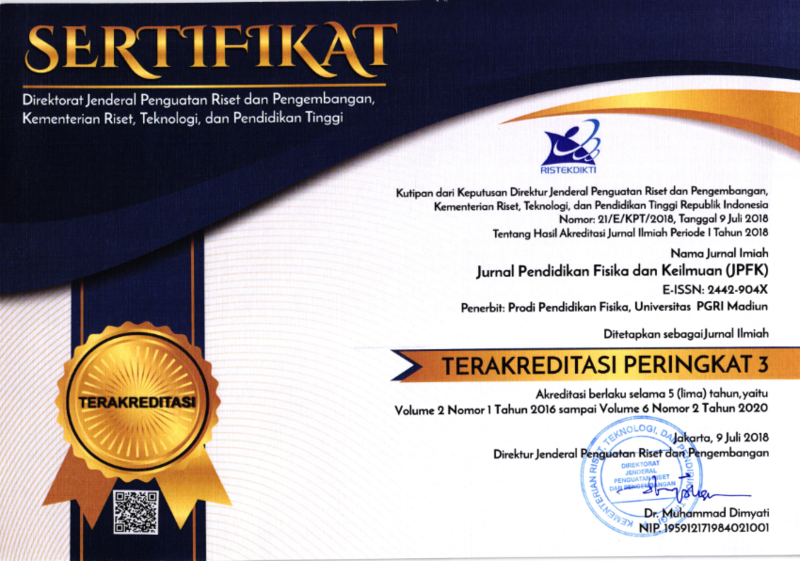 Based on quotations from the Decree of the Director of Research and Development, Ministry of Research, Technology and Higher Education of the Republic of Indonesia Number 21 / E / KPT / 2018 on July 9, 2018 Jurnal Pendidikan Fisika dan Keilmuan (JPFK) designated as ranked 3rd accredited scientific journal. Accreditation is valid for five years, starting from volume 2 issue 1 in 2016 to volume 6 issue 2 in 2020. Information on the certificate of accreditation clicks here. You have to make sure that your paper is prepared using the JPFK Template, has been carefully proofread and polished, and conformed to the author gudelines. Please read this guideline carefully. Every manuscript sent to the editorial office of the journal ought to follow the writing guidelines. If the manuscript does not meet with the author guidelines or any manuscript written in a different format, the article will BE REJECTED before further review. Only submitted manuscripts that meet the journal's format will be processed further.